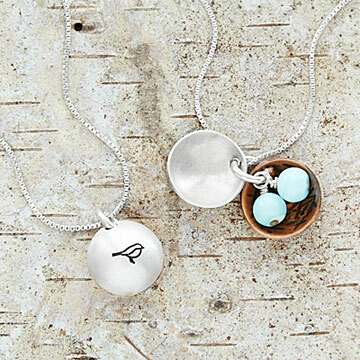 Keep your baby birds nestled near your heart with this locket that protects up to four Amazonite "eggs." Whether your little ones are right down the hall or have just flown the nest, you'll always keep them close. Artist Trudy James sends this sentimental message home in her beautifully handmade necklace. Like a mother's wing, the sterling silver dome on each locket protects up to four Amazonite inside--one for each of your own little birds. A warm, textured copper interior cradles the precious eggs, while a hand-stamped bird silhouette completes the motherly display. Handmade in San Diego. Each necklace comes with a small abrasive pad. Copper develops a warm, deep patina over time, but if you choose, brush the copper and silver discs lightly with a light stroke of this pad to maintain the original satin look. Since each locket is individually hand crafted, there will be slight variations. The length was great and the small size made it look very expensive and feminin. I like that you can add up to 4 eggs. I also loved the metals used and the chain looked sturdy and shiny. My daughter will love this. A reminder of her three baby " birds". It's beautiful and unique. I'm sure she'll love it. Such a fantastic idea. The necklace is simply beautiful. I first saw this necklace in the catalog a few years ago and requested it from my husband for Christmas. He came through! I then wore it every day until this summer the chain gave out. Luckily I didn't lose the pendant when that happened, so I popped it on another silver chain. A few weeks later, one of the eggs came off (again, wasn't lost, but I couldn't figure out how to reattach it). I hoped against hope that the necklace was still available, and it was! My new one is a teeny bit different ( the copper is hammered slightly unevenly) but that's part of the charm of being handmade! I'm happy to be able to wear it every day, as before. I saw this necklace here while shopping for another gift for my nephew. Loved it and sent a "hint email" link to my grown sons who live in other states than me. They sweetly purchased it for me for Mother's day. I wore it constantly and would get many compliments! The problem is that it tarnishes like no other silver that I have ever seen. And the copper, too, for that matter - it's like it became oxidized. I have a history of jewelry making and worked mostly with silver and have never seen a tarnish like this. I did not use the abrasive pad provided, as I did not want to scuff the metal to the degree that I thought would damage it. I tried a regular jeweler's cloth - which normally works on EVERYTHING silver. Nothing....needless to say I am extremely disappointed :( I really loved this necklace and the sentiment behind it. P.S. I wrote this review about a month ago and it was never posted, so am rewriting it. This necklace looks great on my wife. My wife wears this necklace everyday. She loves what it represents to her and how it looks. I knew this was the perfect gift the moment I saw it! This is a beautifully designed hand-crafted piece. The artist's selection of Amazonite for the bead was thoughtful and meaningful. The piece evokes a great emotion. With one brother moving across the country, me getting married, and my other 2 brothers growing up, my mom's nest is feeling emptier and emptier. The 4 of us purchased this necklace for her for Mother's Day this year as a reminder that we'll always be with her. She's not a crier, but this necklace brought her close to tears. This is such a beautiful piece, and I trust she'll wear it happily for years to come.